Objectives: The aim of the present study was to evaluate the diagnostic performances of strain and wall thickening analysis in discriminating among three types of myocardium after acute myocardial infarction: non-infarcted myocardium, infarcted myocardium without microvascular obstruction (MVO) and infarcted myocardium with MVO. Methods: Seventy-one patients with a successfully treated ST-segment elevation myocardial infarction underwent cardiovascular magnetic resonance imaging at 2-6 days after reperfusion. The imaging protocol included conventional cine imaging, myocardial tissue tagging and late gadolinium enhancement. Regional circumferential and radial strain and associated strain rates were analyzed in a 16-segment model as were the absolute and relative wall thickening. Results: Hyperenhancement was detected in 418 (38%) of 1096 segments and was accompanied by MVO in 145 (35%) of hyperenhanced segments. Wall thickening, circumferential and radial strain were all significantly diminished in segments with hyperenhancement and decreased even further if MVO was also present (all p < 0.001). Peak circumferential strain (CS) surpassed all other strain and wall thickening parameters in its ability to discriminate between hyperenhanced and non-enhanced myocardium (all p < 0.05). Furthermore, CS was superior to both absolute and relative wall thickening in differentiating infarcted segments with MVO from infarcted segments without MVO (p = 0.02 and p = 0.001, respectively). Conclusions: Strain analysis is superior to wall thickening in differentiating between non-infarcted myocardium, infarcted myocardium without MVO and infarcted myocardium with MVO. Peak circumferential strain is the most accurate marker of regional function. Key Points: • CMR can quantify regional myocardial function by analysis of wall thickening on cine images and strain analysis of tissue tagged images. 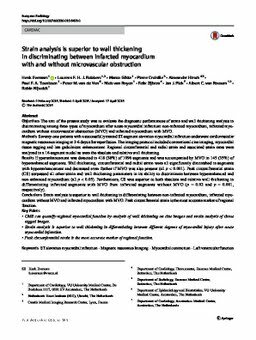 • Strain analysis is superior to wall thickening in differentiating between different degrees of myocardial injury after acute myocardial infarction. • Peak circumferential strain is the most accurate marker of regional function.